Flip Flops and Florida just go together like baseball, hot dogs and apple pie. But can they be dangerous to your feet? Dr. Oz says that they can be problematic and this Tampa foot doctor fully agrees. OK granted many of you wear flip flops on a daily basis and you have no problems. So here’s the big question. Can they eventually lead to foot damage? The answer is yes. 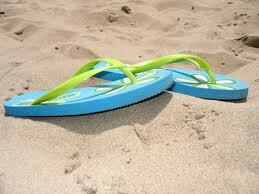 When you wear flip flops, your foot is unstable and turns inward, also known as pronation. So your foot has to compensate to try and stabilize your foot. So even if you don’t have foot pain, you are creating instability which eventually leads to foot strain and damage. Down the line this may result in strained foot tendons and ligaments, foot and ankle sprains, stress fractures or even arthritis of the joints! If you are wearing flip flops and have pain, you are likely straining the large band on the bottom of your foot known as the plantar fascia. And Dr. Oz fully agrees that flip flops can cause plantar fasciitis. Heel pain and plantar fasciitis have become an epidemic. I’m sure that everyone reading either has had heel pain or knows of a friend or family member that has suffered with heel pain. So do you need to throw out all of your beloved flip flops? You just might be better off. So I know that you must need an alternative. Well, I agree again with Dr. Oz., Orthaheel sandals are a great alternative. These sandals let you enjoy the weather while providing arch support that will lead to a more stable foot. They may not be perfect but we all agree that life is too short to be without flip flops. They are one of those simple life pleasures. If you do develop heel, arch pain or other foot pain, get treatment immediately. Call Dr. Marc Katz in Tampa today for an appointment, same day in most cases. You Deserve Heel Pain Relief. I’m offering you my Heel Pain Book for FREEwhile supplies last. Does your big toe hurt during sports? Tampa podiatrist tells why!